Greenpeace protesters have disrupted a speech used by Tony Blair to launch an energy review which could lead to new nuclear power stations in the UK. Two protesters climbed up into the roof of the hall where Mr Blair was due to address the Confederation of British Industry conference. After a 48-minute delay, Mr Blair made his speech in a smaller side-hall. He said renewable sources could meet some but not all energy gaps and the review would examine nuclear options. Opening his speech in a packed room in the Business Design Centre in Islington, London, Mr Blair said: "Nuclear power is of course a difficult and a challenging issue. "Like most tough issues what we actually need is an open and democratic debate, not one conducted by protests and demonstrations to stop people having the freedom to express their views." Amid the noise from clattering microphones and mobile phones ringing, Mr Blair joked: "This is going to be a surreal occasion... I'm going to give this speech if it's the last thing I do." Greenpeace wanted to be allowed to make a 10-minute speech in return for ending the protest. But CBI director general Digby Jones decided to move the PM's speech instead, saying: "At the end of the day I don't give in to ultimatums." He said he had offered two "legitimate" Greenpeace delegates the chance to ask the prime minister the first question after his speech in return for ending their protest, but they had refused. 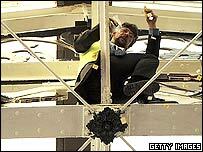 The two protesters, wearing yellow jackets over their suits and with conference delegates' badges, appeared on girders in the roof about 20 minutes before Mr Blair was due to begin at 0930 GMT. 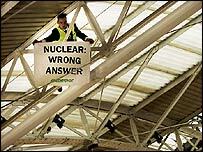 One unfurled a banner saying: "Nuclear: Wrong Answer." They also dropped stickers onto the delegates below them. The men, both believed to be trained climbers, were attached by loops of rope to the roof girders. Greenpeace named the protesters as Huw Williams and Nyls Verhauelt. They have now been arrested and taken to a London police station. Mr Verhauelt said: "We should have a democratic right to have a voice here as well. This was the only way we could say what we wanted to say." CBI deputy director general John Cridland condemned the protest as "quite disgraceful". He said the two men had posed as employees of a fictitious company, E-Lingo and had booked for the conference as delegates last week. Mr Cridland said "it would be a sad day" if every company had to be checked out before being granted access but the CBI would be holding a full review of security. Metal detectors and x-ray machines were used at the conference, and delegates' bags were searched on entry. The CBI says initial investigations show the men entered the building wearing climbing harnesses, concealed beneath their clothes. These would not be detected by the security equipment. The prime minister is believed to view nuclear power as a way to improve the security of the UK's energy supply and also help to meet UK greenhouse gas targets. Business chiefs want a quick decision. Green groups say there are cleaner and safer alternatives to fossil fuels. Mr Blair said the energy review would be headed by the Energy Minister Malcolm Wicks and report by the middle of next year. The review would "include specifically the issue of whether we facilitate the development of a new generation of nuclear power stations", he said. Should there be a new generation of nuclear reactors?